Urethane Robot Wheels – Polyurethane Robot Wheels! Urethane robot wheels are custom designed by robotics engineers with tight tolerances that will operate well in extreme environments. Cast from high-quality resin for extreme vibration damping so that video images provided by the robot are clean. Urethane robot wheels will hold up well against water, heat, chemicals, solvents and are custom made with superior physical properties vs similar material such as plastic or rubber wheels. From prototype to high volume parts Plan Tech’s team of engineers will incorporate every fine detail into your urethane robots wheels. Robots for military applications and other industries are rapidly evolving and require a high load and high compression abilities that function for years and years. Our urethane robot wheels material has been proven to withstand tens of thousands of miles showing little to no wear in most applications. Common designs will have an aluminum rim for a lightweight durable design. From start to finish Plan Tech will machine each wheel to print before being media blasted to ensure our bond strength is as tuff as our urethane material. Bonding directly to the wheel will ensure the urethane tread will never delaminate resulting in downtime. Custom made to your request Plan Tech can rapidly build urethane robot wheels with little to no tooling charge. 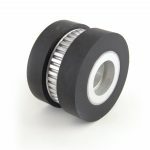 Being able to open cast wheels allows us the ability to machine the urethane as a secondary to ensure each wheel is the same size for encoder style drive motors. In high-speed applications, the finished poly wheels will be spun at speed and machine balanced just like a car tire to ensure smooth operation. Each and every one of our custom urethane robot wheels is chemically engineered to dissipate static electricity to eliminate the need to ground the robot from an electrical build-up while running at speed for a safe and long lasting service life. Urethane robot wheels can be super soft or extra hard depending on the load capacity required. Most common durometers have a hardness between 60A to 95A. Whether the robot will be driving over uneven surfaces or navigating a warehouse our urethane will provide the traction and durability needed in high demand applications. Please Contact us for further details regarding your urethane robot wheels!